And federal law makes it illegal for them to keep the guns in Every state. The highlighted ones just make it double special illegal. I guess they find federal law useless- that's why every state must duplicate it. I wonder why they keep pushing for more federal laws then. Please elaborate on exactly what federal law you're referring to. "Please elaborate on exactly what federal law you're referring to." I believe they're referring to the Lautenberg Act. It has a link to a copy of the US Code section. The code section prohibits possession by those who have been convicted of even misdemeanor domestic violence. This has been expanded by regulation to cover anyone subject to a protective order. This is why, if you have an order of protection against you, your lawyer is going to tell you to get all guns out of your possession even if the court didn't tell you to yet--you are now a prohibited person and subject to prosecution if you retain the guns and ammo. Now can we expect you to stop constantly repeating the canard that in most states it is legal for abusers to have guns? The article I posted says this is largely unenforced unless the state law requires it. Of course you guys try to ignore that and quote the letter of the law pretending it really works. And what's to stop the same state law from being "largely unenforced"? What kind of thinking leads you to believe that if police are not spending as much resources as you would like on a law that is already in place, that the solution is to make the same law again for them to also not enforce? If it is largely unenforced, that's a problem that can be solved through better law enforcement--it does not require making it illegal a second time at the state level. Also, your side usually omits the existence of this federal law, or outright lies by making comments about "gun rights trumping orders of protection." After all, it's easier to motivate people by making them think that there is no law on the books rather than telling them "we need to hold our officials responsible for enforcing the laws on the books." Actually, Minnesota doesn't require surrender of firearms to the police. This law was recently passed in Minnesota and the original version of the bill had no protections to insure due process and required surrender of arms to police. The law as passed insured a hearing prior to banning possession of firearms and also allowed the person in the order to turn custody of the firearms over to a third party. 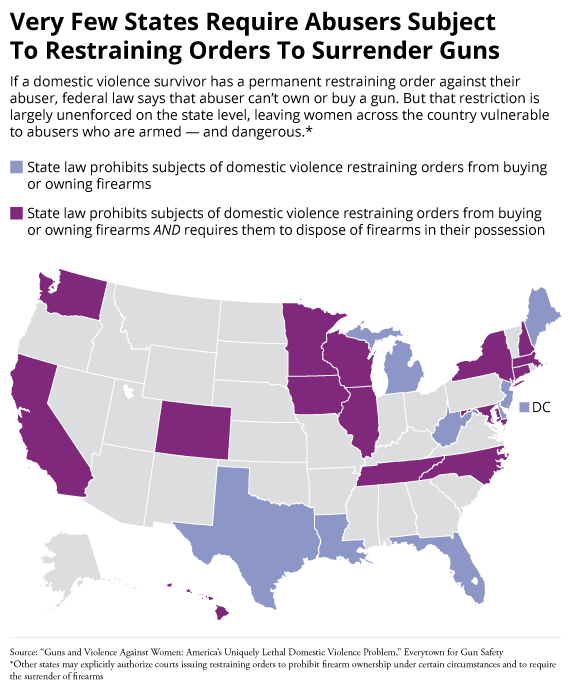 Do you think abusive men who have permanent restraining orders out on them should continue to own guns? Your Freudian slip is showing Mike. I try to think in terms of not discriminating based on gender. Most protection orders aren't permanent. And the article above isn't referring to solely permanent orders. I have a problem with civil orders being allowed to take away rights. Mainly because these orders are often misused and the lower burden of proof. It wasn't a Freudian slip. Most abusers are men, referring to them as such is just as valid as referring to NRA members as white. Does that include any and all civil orders SS? Is it as valid as referring to all terrorists as Muslims? What about crimes where most of the people committing them are from one ethnic group or another? Do these rules of generalization apply to everything, or are you the only one who gets to use them? "Does that include any and all civil orders SS?" Anon, your question seems to suggest you wish to stray from the thread topic. Lets try to at least try to keep on track a little bit. For example, lets limit this side discussion to the discussion of civil orders affecting gun rights. "I have a problem with civil orders being allowed to take away rights." You mentioned no such limitations in your statement I quoted above. Noted, you don't wish to answer the question, even though you brought it up.